Abstract: We present two innovative approaches to go beyond the capabilities of standard optical microscopy which is limited to a transverse resolution of approximately half a wavelength due to the diffraction, also termed the Rayleigh or Abbe limit. The resolution is inversely proportional to the Numerical Aperture (NA). One method to increase the NA is to increase n, the refractive index of the material in the object space. We recently developed a new technique involving a Numerical Aperture Increasing Lens (NAIL) for diffraction limited subsurface microscopy. The NAIL technique is demonstrated by near-IR inspection of Si integrated circuits yielding a 230 nm resolution at 1050 nm wavelength representing a factor of 4 improvement over the state-of-the-art. We have applied this technique to photoluminescence and PLE measurements of InAs/GaAs quantum dots and demonstrated high collection efficiency and spatial resolution better than 400 nm. We also used NAIL technique in subsurface thermal emission microscopy of Si integrated circuits and achieved improvements in the amount of light collected and the spatial resolution, well beyond the limits of conventional thermal emission microscopy. We experimentally demonstrate a lateral spatial resolution of 1.4 µm and a longitudinal spatial resolution of 7.4 µm, for thermal imaging at free space wavelengths up to 5 µm. We also examine in detail the ability of sharp metal tips to enhance local optical fields and describe a new approach to nano-optics, that of combining solid immersion microscopy with tip-enhanced focusing and show how such an approach may lead to 20 nm resolution with near-unity throughput. Spatial resolution can also be improved beyond the diffraction limit by collecting spectral information. We have built on our experience on resonant optoelectronic devices and developed a novel application to fluorescence microscopy that promises nanometer resolution in biological imaging. Over the past 20 years fluorescence microscopy has developed into a standard tool in biological sciences. Today, confocal microscopy provides three-dimensional resolution on lateral length scales of 0.5 micron and axial length scales of 0.75 micron with good imaging speed for studies of biological systems. In the past few years, the increased resolution achieved through advanced fluorescent probes and two-photon sources has made possible the coarse examination of structures at the subcellular level, complementing decades of molecular biology with the nascent ability to localize subcellular processes. We have developed an alternative method, spectral self-interference fluorescent microscopy. The technique transforms the variation in emission intensity for different path lengths used in fluorescence interferometry to a variation in the intensity for different wavelengths in emission, encoding the high-resolution information in the emission spectrum. Using monolayers of streptavidin, we have demonstrated better than 5nm axial height determination for thin layers of fluorophores and built successful models that accurately fit the data. Initial experiments on fluorescently labeled lipid layers successfully determined the binding of fluorescent molecules in membranes with sub-nanometer precision. Recently, the orientation of ss and dsDNA monolayers on silicon oxide is studied by tracing the location of a fluorescent label attached to the DNA. Biography: M. Selim Ünlü is a Professor of Electrical and Computer Engineering, Biomedical Engineering, and Physics at Boston University. He is also serving as the Associate Chair of ECE for graduate studies and the Associate Director of Center for Nanoscience and Nanobiotechnology. His research laboratories are located in the Photonics Center. Prof. Ünlü received the B.S. degree in electrical engineering from Middle East Technical University, Ankara, Turkey, in 1986, and the M.S.E.E. and Ph.D. in electrical engineering from the University of Illinois, Urbana-Champaign, in 1988 and 1992, respectively. His dissertation topic dealt with resonant cavity enhanced (RCE) photodetectors and optoelectronic switches. In 1992, he joined the Department of Electrical and Computer Engineering, Boston University, as an assistant professor. He worked as a visiting professor at University of Ulm, Germany in 2000. Dr. Ünlü's career interest is in research and development of photonic materials, devices and systems focusing on the design, processing, characterization, and modeling of semiconductor optoelectronic devices, especially photodetectors, as well as high-resolution microscopy and spectroscopy of semiconductor and biological materials. 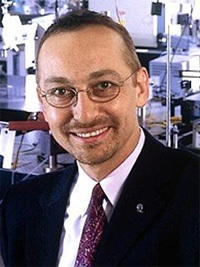 During 1994-1995, Dr. Ünlü served as the Chair of IEEE Laser and Electro-Optics Society, Boston Chapter, winning the LEOS Chapter-of-the-Year Award. He served as the vice president of SPIE New England Chapter in 1998-1999. He was awarded National Science Foundation Research Initiation Award in 1993, United Nations TOKTEN award in 1995 and 1996, and both the National Science Foundation CAREER and Office of Naval Research Young Investigator Awards in 1996. He has authored and co-authored over 200 technical articles and several book chapters and magazine articles; edited one book; and holds several patents. His professional service includes the former chair of the IEEE/LEOS technical committee on photodetectors and imaging and currently, the chair of IEEE/LEOS Nanophotonics committee and an Associate Editor for IEEE Journal of Quantum Electronics.